iRealHousewives | The 411 On American + International Real Housewives: Sneak Peek: Brandi Redmond And Stephanie Hollman Finally Meet And LeeAnne Locken Confronts Stephanie At Her Halloween Party! Sneak Peek: Brandi Redmond And Stephanie Hollman Finally Meet And LeeAnne Locken Confronts Stephanie At Her Halloween Party! On Monday's all-new episode of The Real Housewives of Dallas — Brandi Redmond and Stephanie Hollman make an attempt to repair their broken friendship, but after so much damage, it may be too late. With no experience parenting, D’Andra Simmons tries her best not to be an evil stepmother when Jeremy’s 20-year-old son moves in. Meanwhile, LeeAnne Locken's latest anger management session doesn’t prevent her from showing up at Stephanie’s Halloween party dressed to kill. Watch a sneak peek preview below! In this clip, Brandi Redmond explains to LeeAnne Locken the reason why she decided to cut Stephanie Hollman off. In this other clip, D'Andra Simmons and her husband do their best Monica Lewinsky and Bill Clinton impression for Stephanie Hollman's Halloween party. In this other clip, Stephanie Hollman's Halloween party turns from scary good fun to just plain scary as her tension with LeeAnne Locken continues to linger. LeeAnne Locken shows up in a split personality costume -- half angel, half devil -- and apparently, it’s meant to be a nod to the night’s host. 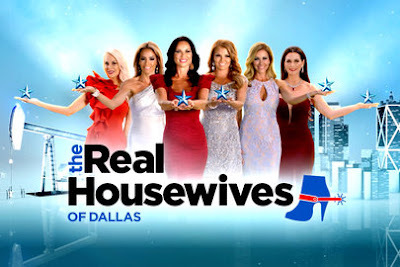 Stephanie tells Travis to leave LeeAnne be, deciding to talk things out with her frenemy herself, in front of returning cast members Brandi Redmond and Cary Deuber, as well as season one star Tiffany Hendra, who makes a cameo. LeeAnne calls out Stephanie for allegedly talking behind her back, and asks that, moving forward, she change things up. “I feel like y’all need to have a private conversation, without us involved,” Brandi, who grew closer to LeeAnne between seasons, chimes in.